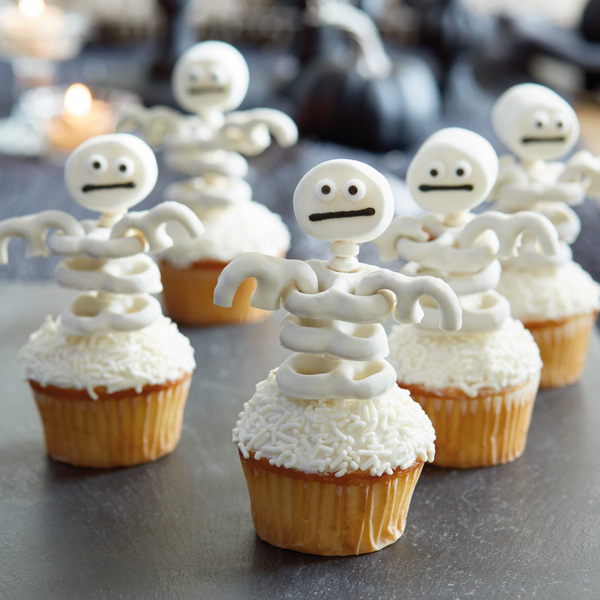 Skeleton Cupcakes pair easy DIY toppers with home-baked or store-bought cupcakes. The skeletons are made of yogurt covered pretzels, candy necklace beads, and marshmallows. This kid-friendly cupcake decorating activity is a little silly and a little spooky—and looks adorable on your Halloween table. Poke one cake pop stick into the center of each cupcake, making sure you have a few inches sticking out the top. Get the heads ready: On one flat side of each marshmallow, draw a mouth (as happy or scary as you like!) with the food-safe marker. Then add two dots of decorating gel to stick the googly eyes on. (You can also just draw eyes on with the marker.) Set them aside. Stack the following on the cake pop stick for each cupcake: 1 yogurt pretzel, 1 candy bead, 1 yogurt pretzel, 1 candy bead, 1 yogurt pretzel, 2 candy beads. Break or cut the tops off 24 pretzels to use as arms. Stick them inside the top rib (see picture) You can add a little decorating gel to help them stay in place if you’d like. Top each skeleton with a marshmallow, with the head facing the same direction as the tops of the pretzels (they should look like ribs).